Non Non Biyori Repeat, the sequel season to the beloved 2013 slice of life comedy series about four girls ranging from first grade to eigth grade living in the Japanese countryside, is a case of “second verse, same as the first” in that time does not progress forward from the end of the first season. In fact quite the opposite happens. 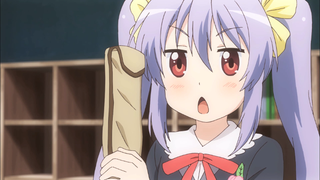 Non Non Biyori Repeat goes back to before the events of the first season, with the first episode being Renge’s first grade entrance ceremony, complete with her receiving her iconic recorder (see the header picture for her reaction). In fact all of the events that have happened so far in Non Non Biyori Repeat weave around the events of the beginning of the first season. But that doesn’t mean Non Non Biyori Repeat isn’t worth watching. While time doesn’t move forwards, the characters themselves do. Getting new looks at the characters at different points in the story has helped their characters progress. Make no mistake, this isn’t a case of the Endless Eight from Haruhi where we just get the same scenes over and over again. And even with the given circumstances, Non Non Biyori Repeat has managed to produce my favorite singular episode in anime so far this year. One of the reasons Non Non Biyori was so beloved back in 2013 was its ability to out of nowhere deliver a precision strike right to your feels. It didn’t take long for Non Non Biyori Repeat to drop its first feels bomb. After some rather lighthearted and fun events in the first three episodes, the fourth episode goes on the offensive. The episode starts out innocent enough, with Renge catching some tadpole shrimp in a rice field that she names Flatty-san (as in, she called all of them that), and she even gets a bright, shiny, brand new pink bike as a gift for starting first grade. Things are looking up for Renge! Except, she can’t ride her bike because it is pouring rain. So she does what many Japanese people do when they want it to stop raining, she made a teru teru bouzu doll. But it has no effect on the rain. Renge comes to the conclusion that it had to be because her doll just wasn’t big enough. So, in typical Renge fashion, she takes matters into her own hands and becomes a teru teru bouzu doll herself. Hijinks ensue when Komari, the dimunitive eigth-grader, runs into the Teru Teru Renge in the fog and mist and she mistakes Renge for a malevolent spirit, thinking the trowel Renge was carrying with her for a deadly weapon. Miraculously it seems like Renge’s ploy worked, as the rain stops long enough for her and her friends to ride their bikes for a day. Renge is basically on cloud nine. Unfortunately she comes crashing back to Earth the following day at school, because when she arrives, she finds the tadpole shrimp, which she was keeping at school and kept a detailed progress report of their growth in a journal, had all died. This devastates Renge, as she is clearly out of it for the rest of the day. After school ends for the day, she mourns by the grave that she and her friends buried the Flatty-sans in earlier that day. It is a powerful scene that lasts for a full twenty seconds of Renge just standing there, unmoving. By this point the episode already delivered enough blows to break through to even the most emotionless people, but even with all the previous scenes, the episode wasn’t done toying with our emotions. For you see, one of Renge’s friends, the seventh-grader Natsumi, was late to getting to the bus stop the day they buried the Flatty-sans, and for good reason. She remembered the life cycle of tadpole shrimp and took a gamble on the previous Flatty-sans laying eggs in the soil of their tank before they died, so she added the soil they threw out back into the tank and set the tank back up again. I’m a tough cookie to crack, when it comes to emotional stuff in anime. Shows that were “guaranteed” to make me cry like Your Lie in April and Anohana didn’t even get me misty-eyed. But this episode managed to do me in. I held strong, even after Renge’s sad drawing, but it was seeing Renge happy again after seeing her so sad and depressed for several minutes that did the trick. Manly tears of happiness were shed at the end of this episode, I’ll fully admit. The strongest part of Non Non Biyori is Renge. Just everything about Renge. From her adorable mannerisms to her childish wonder at pretty much everything. Watching Renge in action makes me think back to when I was a kid, and this episode was no different. It reminded me of all the small little “pets” with short lifespans that I had as a kid. Of all things this episode made me think of that one episode of Rugrats where Chuckie’s pet roly poly died. Non Non Biyori Repeat may very well be literally just more Non Non Biyori, but that is never a bad thing. As I seen someone else say, it may be a season 1b, but I’ll gladly take that over no new episodes at all. Hell I am looking forward to this season ending, and then figuring out the exact chronological order of the episodes from both seasons and then watching the show in the order the events happen in. Non Non Biyori Repeat can be watched on the Crunchyroll streaming service. Non Non Biyori Repeat is based on an ongoing manga by Atto that is currently licensed by Seven Seas Entertainment. Both seasons of the Non Non Biyori anime have been licensed by Sentai Filmworks.